For a senior aging in place, everyday tasks such as using the bathroom can gradually become more difficult to accomplish. Using the restroom is a necessity, but toilets that are too low pose the risk of being hazardous or in some cases even painful for an aging adult. One solution to this issue is the use of a toilet lift. We have outlined a few of our favorite toilet lifts to help you choose the best fit for your needs. What is a Toilet Seat Lift & How is it Helpful? 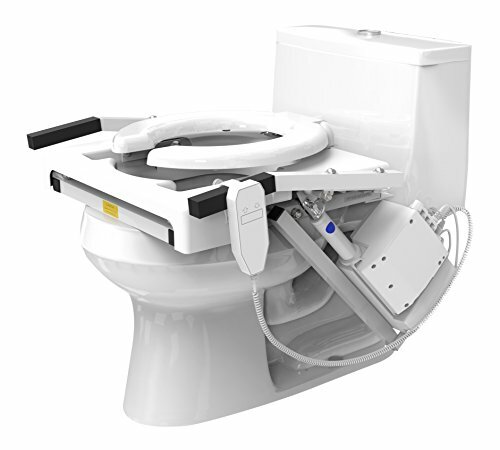 A high-tech and effective solution to difficulty using standard toilets, the Tilt Toilet Lift is innovative and extremely helpful with the ability to adjust to the perfect height for its user. While the price can be a little daunting, the quality of the product speaks for itself. The EZ-Access Tilt Toilet Lift is a technically smart toilet lift that literally adjusts to its user. Bending, standing, and sitting on a toilet that is the wrong size is a potential fall hazard for many seniors. 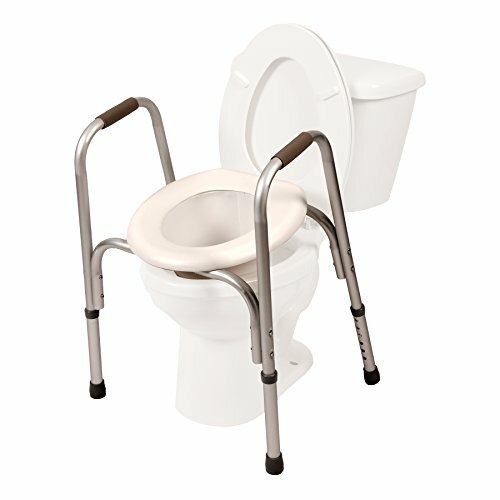 With the use of this toilet lift, seniors and caregivers can adjust the height of the seat for the perfect match every time. Using a simple remote, you can lift both the seat and the arms of this toilet lift to match the user’s natural body movement and position. The arms will remain at a consistent angle as they raise, giving the user level balance and support and minimizing the chance of a fall. The handy remote hooks to the side of the toilet for easy access and features a 9-foot coil cord to make it easier for caregivers to operate. While the toilet lift adjusts for height, you can also move 7.5 inches forward as you attach the unit directly to the toilet bowl. Not only does this product assist with a raised seat, but it includes a sturdy safety frame that lets users hold on for stability. 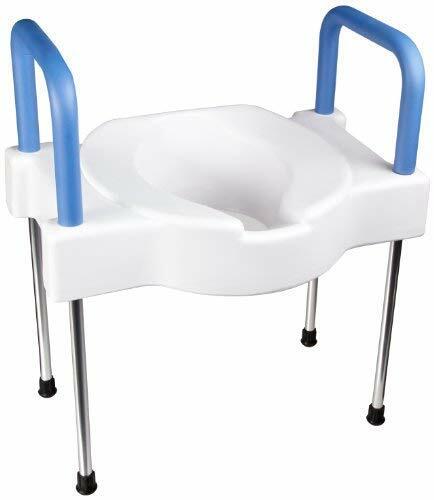 The PCP Raised Toilet Seat and Safety Frame is a product that keeps the well-being of older adults at top priority. The need for a raised toilet seat is common in seniors, but not all seats strive to maintain safety. This seat lift does both. The raised toilet seat sits easily over the toilet to give its users an adjustable lift. If you find bending down to sit too low is getting difficult as you age, then this seat can meet your needs. Adjust the height of the legs for the perfect match. In addition to the lift, this seat is accompanied by an aluminum safety frame that very closely resembles the structure of a walker. This frame provides a handle on each side with a gripping texture. Users can grab onto this sturdy support system to help avoid slips, falls, and use to stand back up. A lightweight and durable product, this seat and safety frame is a great choice for seniors living on their own or even those with the help of a caregiver. Not all elevated toilet seats can accommodate with extra width for heavier weights, but this one does. The extra-wide design makes it comfortable and convenient while providing the same lift as other seats. Many people observe a gain in weight as they age. While this is indeed common, it can pose some issues with everyday activities. The Maddak Inc. Tall-Ette Elevated Toilet Seat features an extra wide seat design intended to make bathroom use easier for older adults with a broader frame. The overall width of this raised toilet seat is 22.5 inches, while the toilet seat opening is 18.5 x 16 inches. These measurements are larger than most standard toilet seat lifts, giving extra room to those who need it. At the same time, the elevated seat works to make sitting and standing easier. The frame comes with comfortable grip foam arms for added support. Users can grab on to steady themselves as they move. These same arms are removable so that you can adjust the height of your seat to meet your needs. Included with this seat are brackets and bolts that help keep the seat in place. Rubber on the bottom of the aluminum legs also keep the frame from sliding, which gives users more stability and prevents falls. Accessibility can be a significant issue in those who are aging in place, and accessibility to the use of the toilet is one of those everyday needs. Toilet seat lifts, sometimes called toilet seat risers, are designed to make toilets more accessible to seniors by raising the surface of the seat. Getting older can mean things like difficulty bending lower, sitting, and standing. Seniors living in their own home can find that the toilet they used to use every day is suddenly too low and is causing them pain. If they continue trying to use their bathroom, they may be putting themselves at risk for falls and slips that can lead to injuries. Toilet seat lifts come in many different designs. Some attach directly to the top of your toilet at a set height, giving you a few extra inches. Others are more functional and come attached to a frame. These frames are placed over your toilet and are often adjustable in height, allowing you to have a more customizable experience. Many toilet seat lifts also include handles. Handles are a great feature because they provide older users with extra support and stability. Without the ability to grab onto something, standing and sitting can be tough and dangerous for seniors. Handles give users a firm foundation and the ability to stand and sit without assistance. Many manufacturers strive to make the installation of a toilet seat hassle-free and straightforward. Complex instructions only cause frustration, and simple assembly lets seniors either install this product on their own or with the help of a caregiver—additionally avoiding paying for a handyman or professional installation. It is very common for people today to want to age in their own home and on their own schedule. It’s hard and often discouraging to give up your independence, and sometimes the downfalls of aging can lead you to think you don’t have a choice. However, with helpful everyday products like a toilet lift, those problematic tasks can be made easier. If you are looking for the very best and latest technology, we suggest trying to EZ-Access Tilt Toilet Lift. However, the other lifts in this article are certainly quality products that provide safety and accessibility in a more standard way.